Just as farmers did a century ago, in the weeks leading up to the Ice Harvest we monitor ice conditions and shovel snow from the pond to foster a good crop of strong, clear ice. Snow acts as an insulator and hampers ice growth. In recent years, the depth of the ice has ranged from 7 inches to more than 18 inches. Hanford Mills Museum has conducted an ice harvest for 31 years, and safety is the priority. At the Ice Harvest Festival, visitors can help harvest ice from the frozen pond if the ice is 8 or more inches thick. 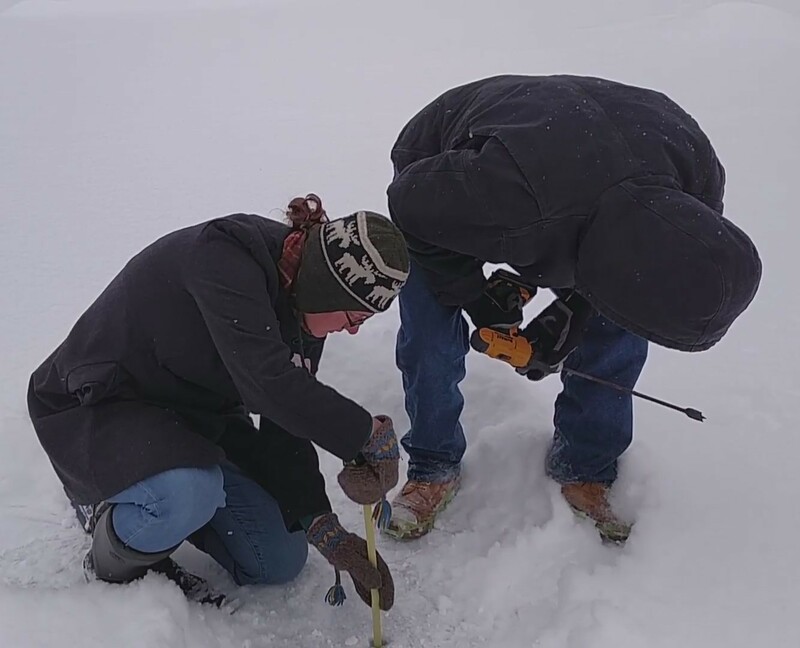 If the ice is 6-8 inches thick, Hanford Mills staff will be on the ice, and visitors can help transfer the harvested ice to the ice house. February 2: More than 200 blocks of ice were harvested, each weighing about 75 pounds. It was a wonderful day for an ice harvest, with sunny skies and little wind. Thanks to everyone who came and helped us fill the ice house. Make sure to come on July 4th when we’ll be making ice cream using the ice we harvested. January 31: Ice is 11+ inches thick. We anticipate that visitors will be able to fully participate in the Ice Harvest on Saturday. And more good news: forecast for Saturday is clear and 26-32 degrees. January 25: Rob measured the ice this morning and it’s 8 1/2 inches thick. January 11: Today we shoveled the snow from the pond and measured the ice at about 4 inches deep. Dress warmly in layers. Hats, mittens or gloves, and boots are recommended. To encourage folks to come at the beginning of the event, everyone who arrives between 10 am and 11:30 am will be entered to win a Mill-made crate filled with books and a Hanford Mills mug, and a family membership. You’ll get to do all the activities without much waiting on line, and you may even go home a winner! Please be aware that GPS provided directions can be unreliable in our area. Traveling on back roads can be difficult, especially in winter weather. Here are suggested directions, and we also welcome your phone calls 607/278-5744. Free parking is available in the large lot across Route 12 from Hanford Mills Museum. Additional parking will be available at the Meredith Historical Society (the former Charlotte Valley Presbyterian Church) at 10044 Elk Creek Road. Admission is $9 for adults, $7 for seniors and AAA members, $4.50 for members of the military. See more information on admission discounts. If you’d like to buy food on site, bring cash. Soup is $3, cookies are $1 each. 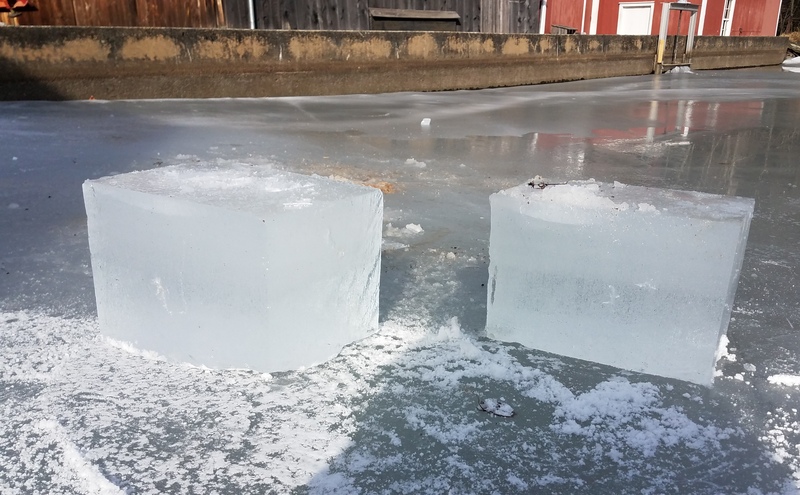 First ice blocks harvested from the pond on Jan. 29, 2018. Take part in a traditional ice harvest, just as communities did a century ago. Festival also includes ice carving by the SUNY Delhi Hospitality Center Ice Team, ice fishing with Trout Unlimited, horse-drawn sleigh rides, snowman village, hot soup buffet, food trucks, blacksmithing and cooking demonstrations, and exhibits by local businesses and farmers. Kids 12 and under get in free; Adults and Teens, $9; Seniors, $7. Ice Harvest Festival at Hanford Mills Museum: History on Ice! [January 27, 2017 East Meredith, NY] The annual Ice Harvest Festival at Hanford Mills Museum on Saturday, February 4th offers adults and children a chance to take part in a traditional ice harvest using historic tools and techniques. Before refrigeration, harvesting ice was an essential winter activity. The ice was stored in ice houses until it was needed in the warmer months to keep food and agricultural products cold. 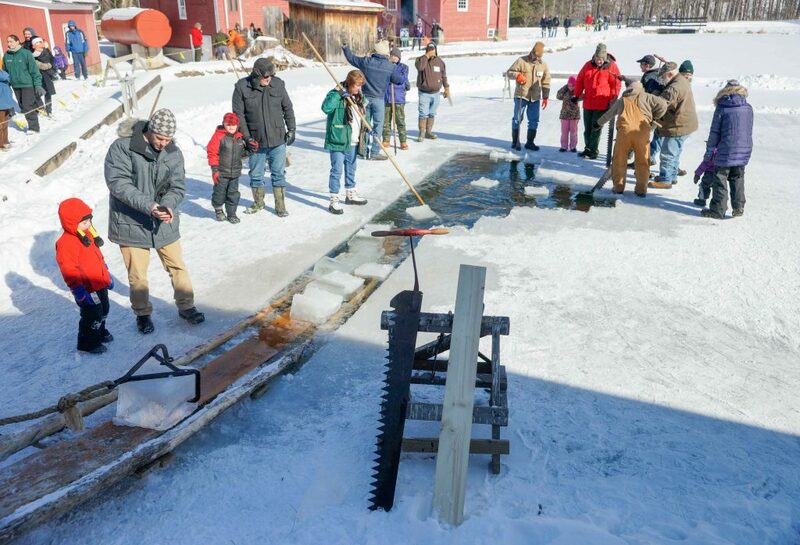 “Kids can cut ice, haul ice, help stack the ice, and get a ride on a horse-drawn sled. It is very different from reading about things in a book; it is real. Of course, the cocoa and soup are always big hits, too,” says Jack Tessier, a board member of Hanford Mills who has attended several Ice Harvests with his wife and children. The SUNY Delhi Hospitality Center Ice Team will create sculptures from blocks of ice. Children can try out ice fishing with the help of volunteers from the Dave Brandt Chapter of Trout Unlimited. Other activities include taking horse-drawn sleigh rides around the Museum site, watching blacksmith demonstrations, shopping from local farmers and businesses, including Promisedland Farm, Byebrook Farm, and the Cooperstown Distillery. There also will be a snowman village, bonfires, and films of ice harvests in the 1920s-1940s. At the Hanford House, which shows family life in the 1920s, visitors can play tabletop games and see historic cooking demonstrations. There will be an auction of the Werner Rentsch painting “Ice Cutting at Hanford Mills NY,” which the noted artist made after attending an Ice Harvest Festival a few years ago. The artist donated the painting for the Museum to use to raise funds. Bidding is now available online at hanfordmills.org. The Ice Harvest Festival, which is always held on the first Saturday in February, regularly brings 1,000 or more people to the small hamlet of East Meredith in Delaware County. Starting in December, Museum staff monitor and groom the ice to ensure a good crop of clear strong ice. A hot soup buffet will feature soup and chili provided by area restaurants, including Brooks’ House of BBQ, Cafe Ommegang, the Cooperstown Diner, Cross Roads Cafe, Danny’s Main Street Market, the Delhi Diner, Doubleday Cafe, Fiesta Mexican Grill, Jackie’s Restaurant, Jay’s Place, Mel’s at 22, Morey’s Family Restaurant, Oneonta Bagel Company, The Otesaga, Simply Thai, Sloan’s N.Y. Grill, Signatures Restaurant, the SUNY Delhi Hospitality Program, Applebee’s, and Denny’s. . Proceeds from the soup buffet as well as the sale of baked goods, which are provided by Junkyard Bakehaus, benefit the Museum’s educational programs. In addition, the Cabana Coffee food truck will offer hot and cold beverages. The Ice Harvest Festival is sponsored by the SUNY Delhi Hospitality Management Department, WSKG, The Daily Star, and Five Star Subaru. Because GPS may take drivers on roads that are not winter-friendly, the Museum has a list of suggested routes available at https://www.hanfordmills.org/visit-a-historic-workingmill/our-location or by calling 607/278-5744. In particular, when driving from the Albany area on Interstate 88, they recommend taking exit 16 (Emmons/West Davenport) instead of exit 18 or 19.